Unique Webgrow India Pvt Limted specialise in organic search engine optimisation (SEO) campaigns for Google, Yahoo! and Bing. 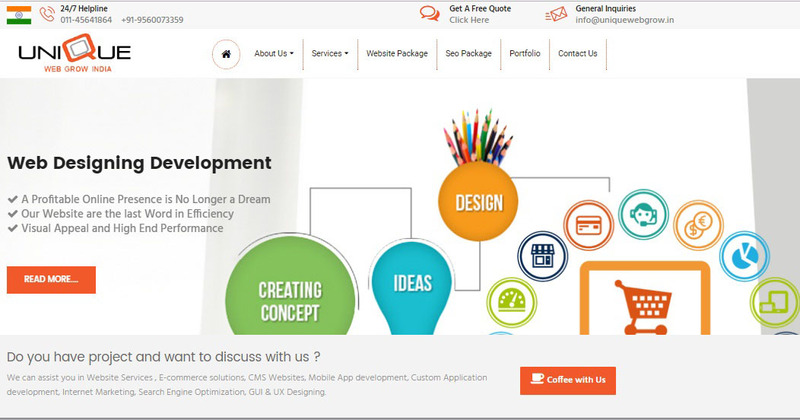 Website Development at a very fare cost!!!! We are providing website solutions in the industry at very reasonable cost. So now you have a great opportunity to extent your Business By having a Beautiful and Dynamic Website. Over the years we have developed a sound engineering process with the help of our experiences to deliver robust, cost effective and reliable web solutions to our clients. The objective of re-engineering a customized solution is to establish a usage of sound engineering principles in the development process. Our competencies have enabled us to cater our clients by providing Innovative Business Solutions. Welcome to Unique Web Grow India. Web Grow is a Indian based marketing services company dedicated to designing effective and strategic websites and other business communication services. We believe in keeping things simple, affordable and relevant. website designing, search engine optimization, domain & hosting and software development. website designing, Website Development, search engine optimization (SEO), domain/hosting and software development. We are providing Total IT Services like : Website Designing, Website Development, Software Development and Search Engine Optimization etc.